Today’s guest strip is by the multi-talented Andrew Gregoire of I Am ARG fame. He’s a great guy who I only have nice things to say about- possibly because I’ve exhausted my supply of new ways to accuse him of being a hipster. Hats aside, he is hands down one of the most considerate people I know and I can honestly say I wouldn’t be doing this strip without his influence. You should join his facebook group. He’d like that. Thursday’s strip will be late because I have a pile of work waiting for me at home. But it’ll be there. ARG is great haha, but now I’m worried for his… um… wife(fiancee?). Comic herpes are very contagious, and kill 99% of people who contract them. Yup.. Arg is awesome… I don’t trust him around small children.. but still a awesome guy! Thanks for subbing for Mary, Hipster Dude! 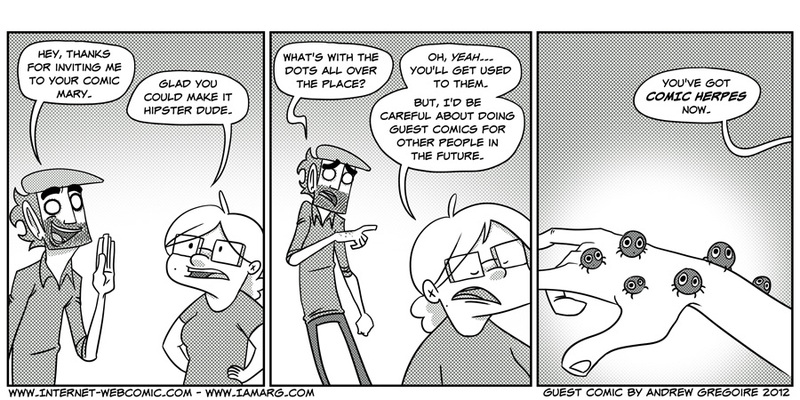 Mary’s guest strip on your site introduced me to here, and now here you are, ARG! Quite literally yes she gave me the letra patterns she uses for her strip. He only got them from her because I was a bad girlfriend and forgot to email them to him. I thought that the handwriting seemed similliar.